Vardhman Special Steels Ltd is in portfolio of Anil Kumar Goel. He is one of the top investors in India. 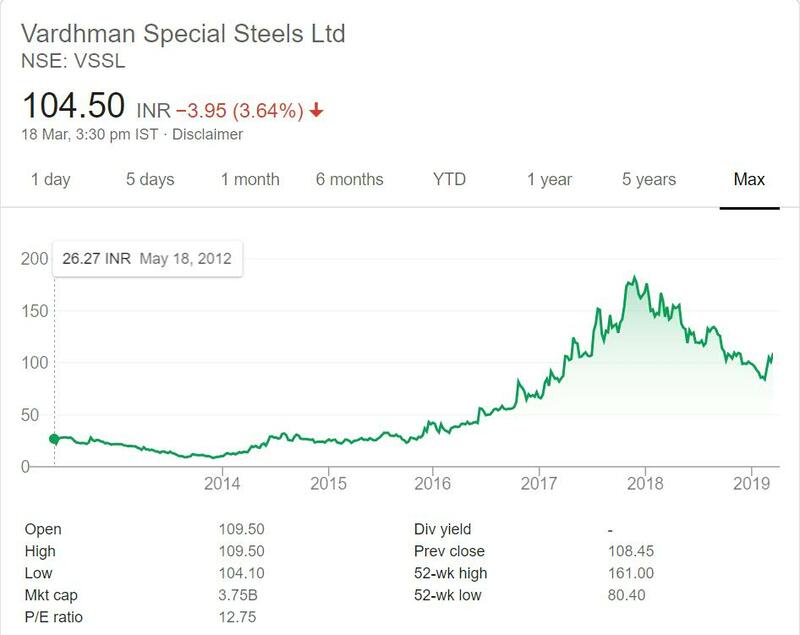 The company belongs to Steel sector. As per the Company website it is producer of hot rolled steel bar for varied applications. It has capacity of 150,000 metric tonnes per annum. It caters to diverse requirements of hot rolled bars for Engineering, Automotive, Tractor, Bearing and Allied Industries. The company has an extensive list of clientele, including various globally renowned corporations, such as Toyota, Hero Moto Corp, Caterpillar, Hino Motors, Bosch are some of the prominent names from the list. The Company has international presence as well. It has presence in Malaysia, Thailand, Sweden, Turkey. It ha Pan India presence with offices in different cities of India including Bangalore, Kolkata, Pune and Chennai. The stock got listed in year 2012 at listing price of 26. After couple of cooling years it slowly moved up the charts. Company has given positive returns in last 6 years. It has given 4 times return to investors in last 6 years. So the investors have made money in the counter over the years. Steel is a cyclic sector with Companies stock prices fluctuating with time. But so far it has moved in positive direction with slight cooling off during recent sell off. But that is part of every positive movement. Vardhman Special Steels Ltd is a Steel Company. It produces different type of steel bars for use in different industries. So you can view it as Business to Business Company. The Company has started focusing on international market along with domestic one. This will help it increase sales and revenue. The short term stock price performance is healthy. Personally I do not like Steel sector. Steel is main stay of today’s World but it is saturating as well. There are lot of players in the market competing with each other for market slice and retaining their market share. The sector will not have good growth going forward. It will have healthy linear growth at best due to Infrastructure projects and demands in different industries like Auto in India. I am not invested in the sector and not willing to invest in future as well.